On the main menu if you wait until the counter on your DVD gets to 1:07 in the bottom right hand corner the Dinoco 400 logo will appear. Go to the bottom choice on the menu (Set Up) and hit the right arrow. 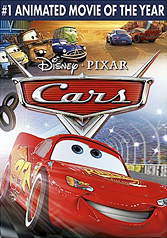 You will unlock a short cartoon with Cars characters in the Pixar short "Boundin". On the Main screen when you first insert the dvd, "Lightning McQueen" is going around the track and you can see a gold trophy go past his face about 3 times (the trophy flys past him pretty fast). Well after several times a little flag icon appears in the bottom right hand corner of the screen. CLICK on it and you will see a short little bonus feature.